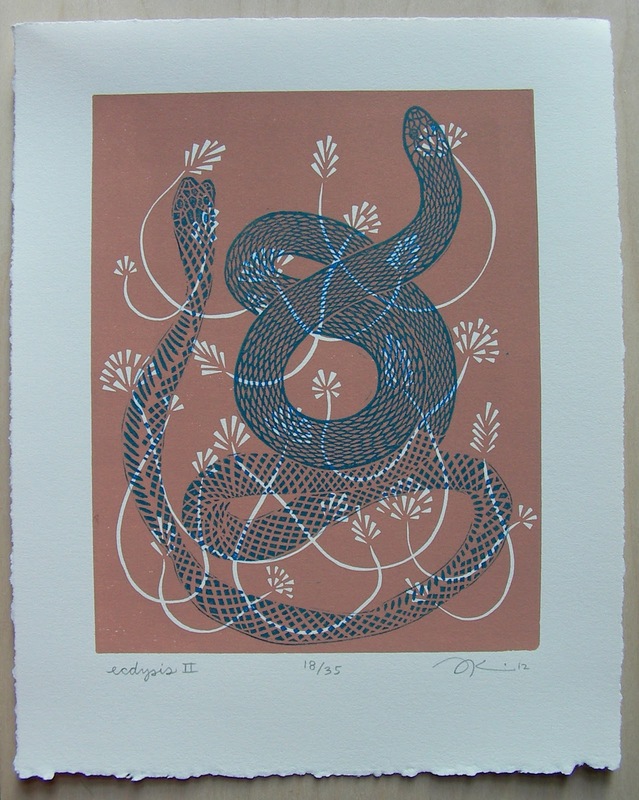 As a printmaker, I constantly have to make decisions about my artwork in terms of concept, composition, color, and technical printing issues. Sometimes the solutions to the challenges presented are simple, and some a little more involved. 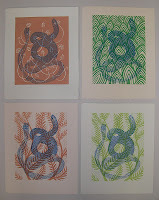 Here are some examples of ways I had to figure things out using my latest prints as an example. 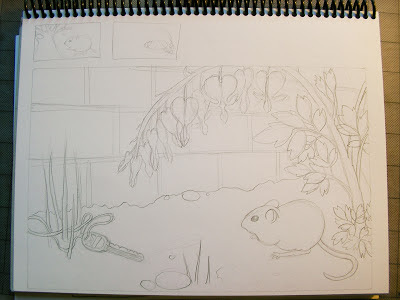 #1: Figuring out color and masking out part of an image. I made my editions "Ecdysis I" and "Ecdysis II" using a new technique for making images and choosing colors. I got the idea from the artist Mariann Johansen-Ellis. 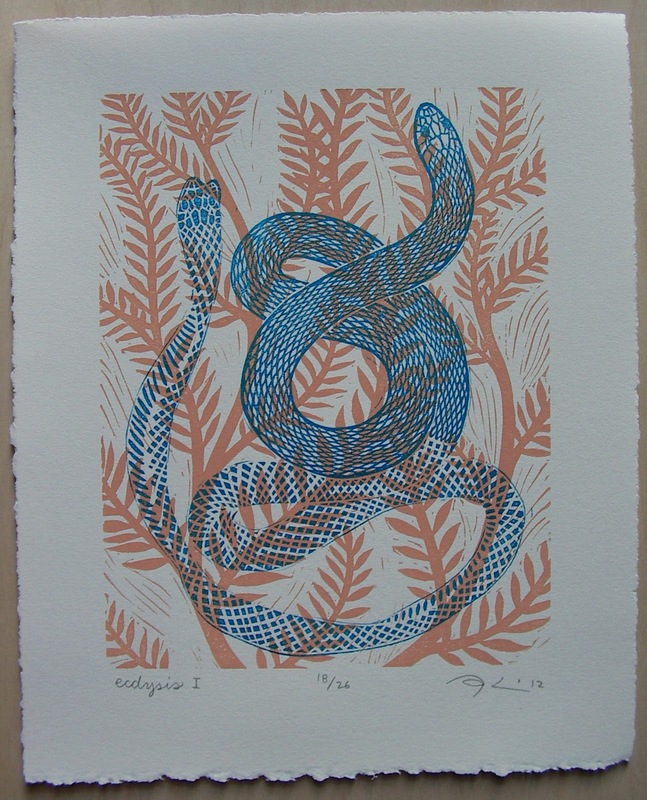 She has lots of informative printmaking videos on her website, including the technique of Lino Mix and Match. 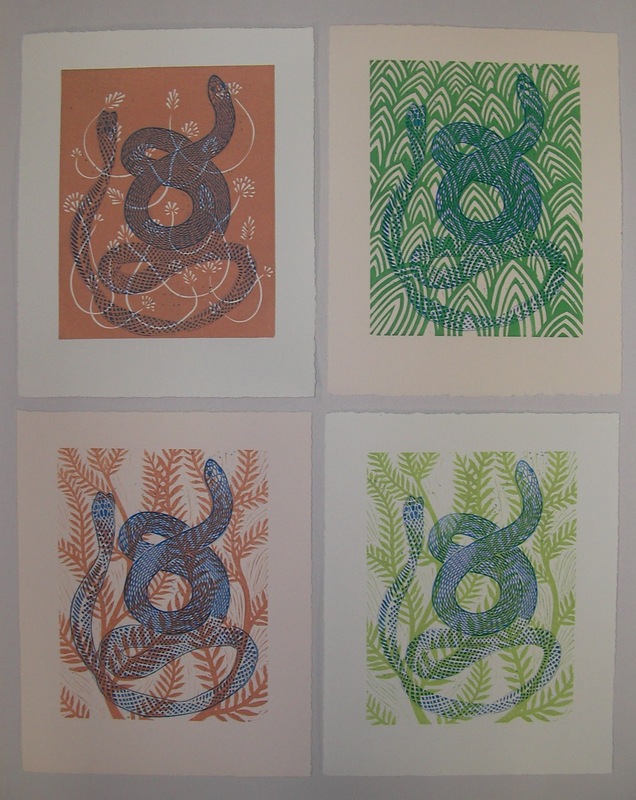 I started out making a few different background patterns that I printed in many different colors, sometimes printing more than one on top of each other. But, I decided I didn't like the way the carving texture looked around the snake (see below). It was distracting, in my opinion. I decided to mask out the texture using a piece of newsprint. I took a piece of newsprint that I had already printed the snake on, and used it as a guide for cutting out the areas I wanted to mask. 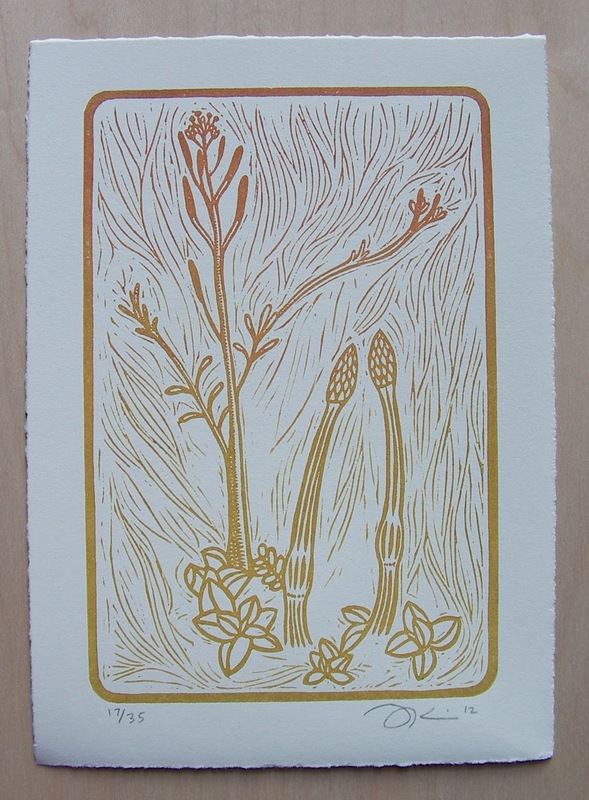 I inked up the plate as usual and placed it on the etching press. Then I flipped the newsprint over and placed it on top of the areas I didn't want to print (the blue lines on the newsprint are from another test proof I had made on that side of the paper). After I had printed onto my final paper, I removed the newsprint mask so I could re-ink the plate and repeat the process for the next print. You can see how the paper caught the ink below. Lesson Learned: Sometimes you can find your way to the best colors by experimenting instead of planning it out ahead of time. And my newsprint mask was a pretty simple solution and I will use it again. 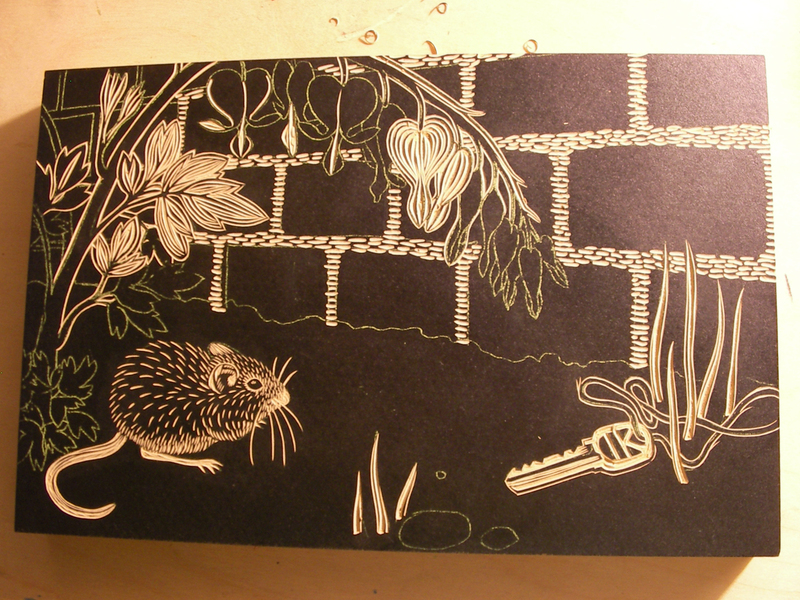 #2: How to perform linocut surgery. Sometimes when I am carving a print, I am just not happy with something I've carved. Such situations are tricky, because it is hard to "fix" something you've already carved away. But here is a solution that is much like "linocut surgery." Warning - I do not recommend this unless you are patient and have a very steady hand. So here is my plate. Just as I was almost finished with carving, I realized that the thumb on the left hand is much too small in comparison to the other fingers. I was annoyed with myself because this was something I should have caught during the drawing phase, not when I was in the middle of carving. Oh well, these things happen. 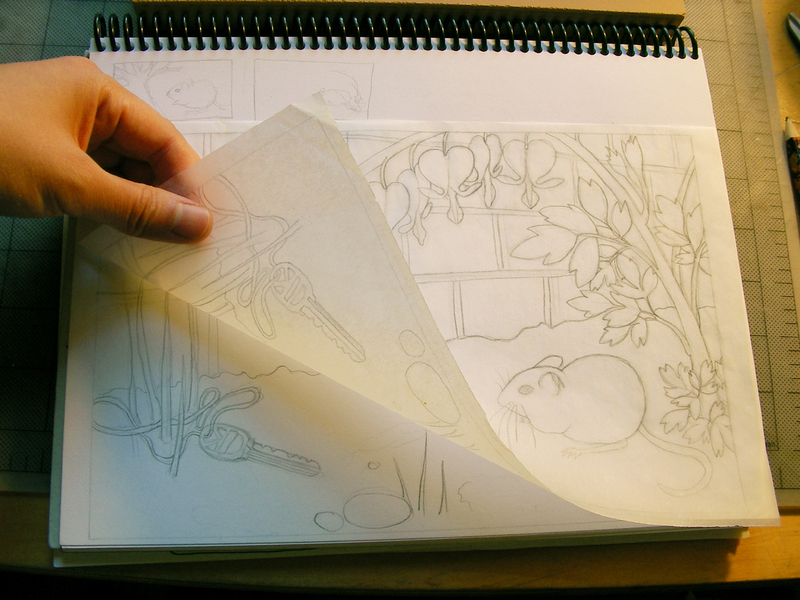 I put a piece of tracing paper over the area and drew in the new thumb. Then I cut it out and placed it over the plate. 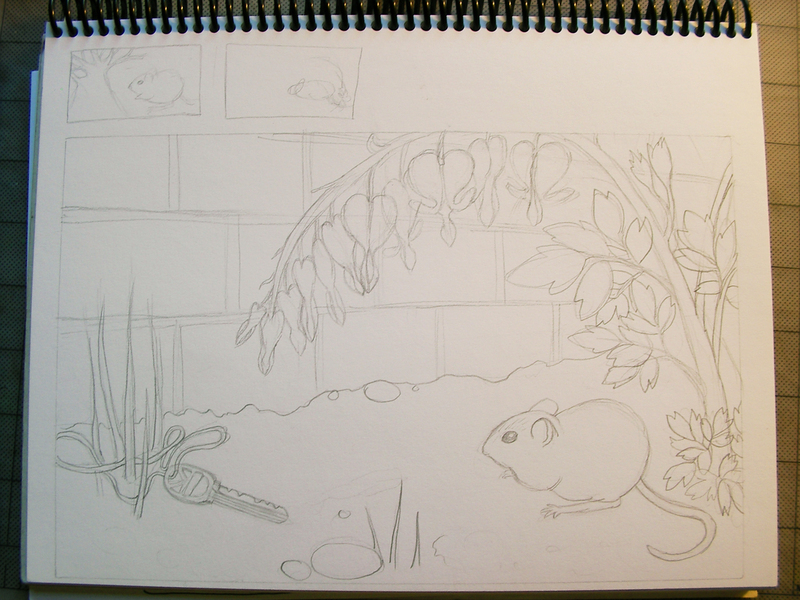 Okay, so I ended up having to make several thumbs because I couldn't get it exactly right. But I'll spare you the details and tell you what I would do next time: First, using a razor blade, cut out the area you want to re-carve. Make sure it is in an area that will more easily blend in with the rest of the carving. 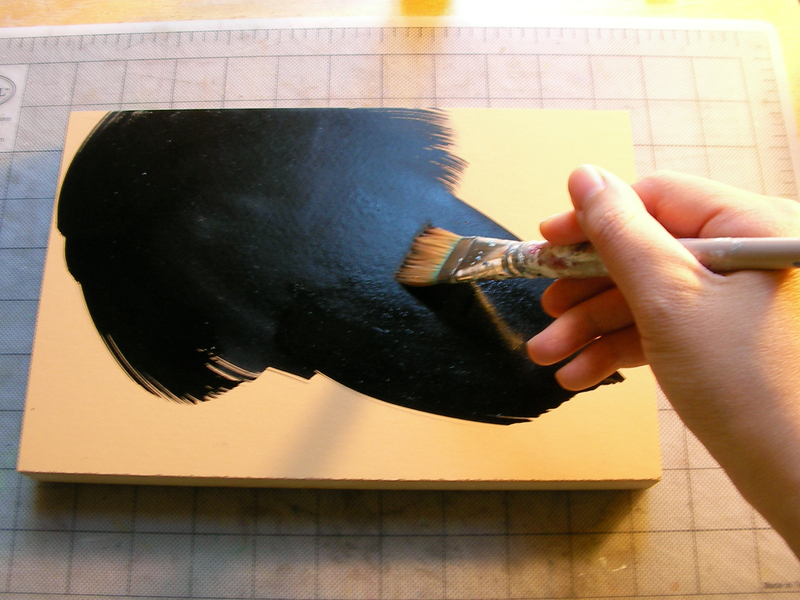 Use the cut-out piece as a template for your new piece. 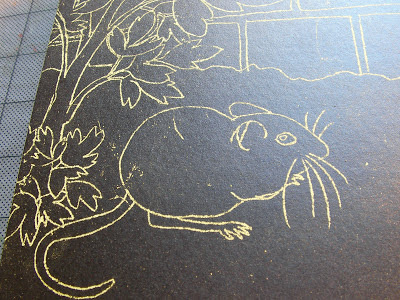 Trace it onto another piece of linoleum. 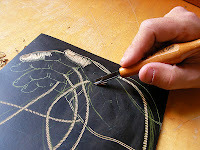 I find it helpful to carve around the outline leaving some extra leeway (it is always easier to carve away if it is too big), then use scissors to cut it out. 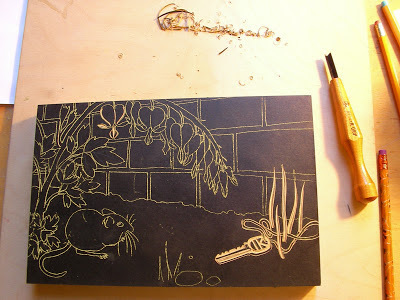 Then I place the piece over the cut-out area in my linoleum plate and check it. If it's too big in areas, I cut it down bit by bit with a razor. This stage is important, because you want it to fit in the missing area as snugly as possible. Here is the new piece that I fit into the plate. It is black because after several attempts, I used a scrap piece of linoleum that was already inked on the surface. Then I placed my tracing paper drawing over the thumb and transferred the details (the thumbnail and creases) using yellow transfer paper. I then carved the new thumb. The finished carving! I haven't printed this one yet. I also need to carve a second plate because it will be a two-color print. 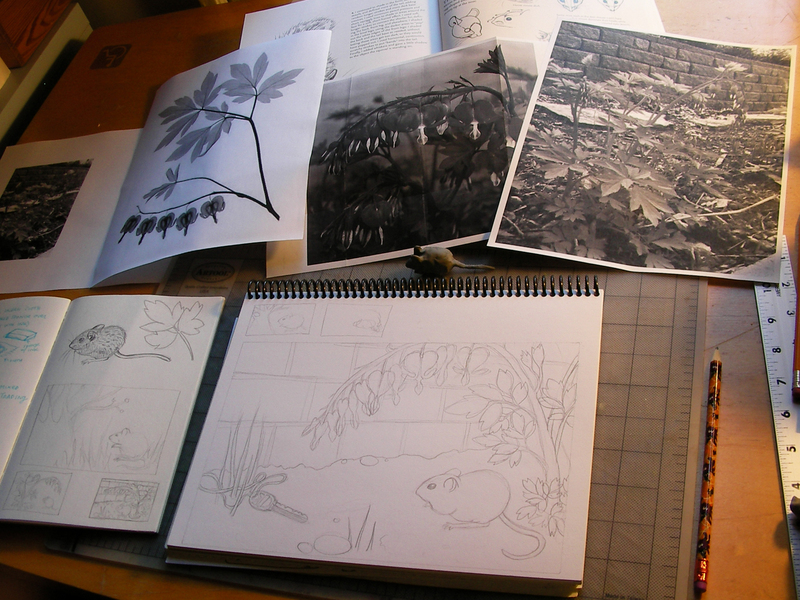 In the past when I've printed linocuts that have had surgery, I have to be more attentive when inking and printing. Sometimes the new piece will pop up a little higher than the rest of the plate, or print a little lower. I hope that this one goes well! Lesson Learned: Linocut surgery can be tricky, but worth it if you are patient and have a steady hand! Best to make sure you are happy with your drawing before transferring it to your plate, to avoid such complicated procedures. Challenge #3 - What do you do when you're not totally happy with your final print? 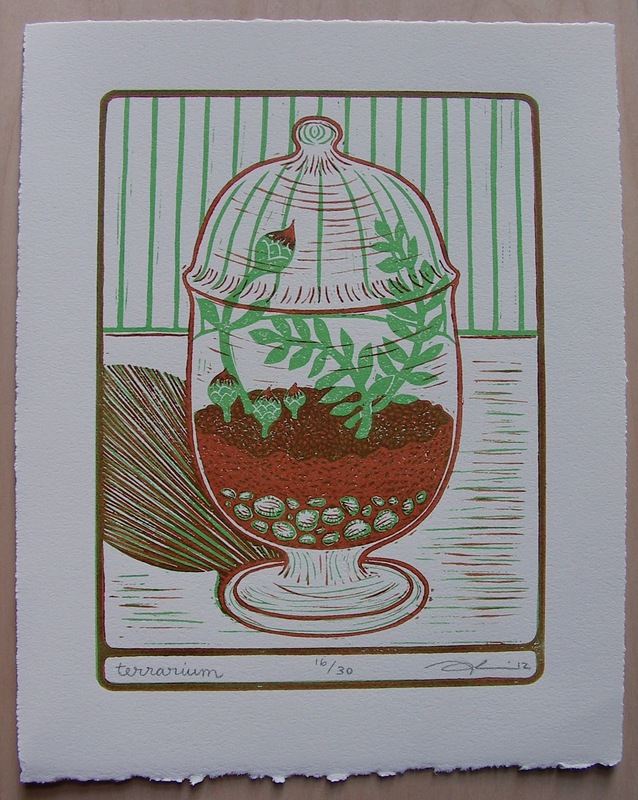 Here is a version of my print "Terrarium." 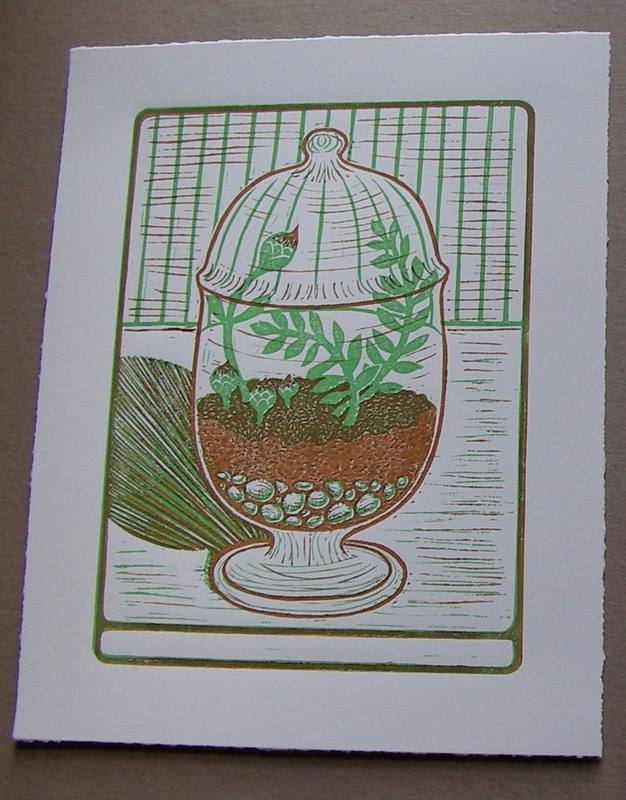 It might be hard to see, but this print has a "salty" look (the ink coverage is thinner, making more of the white paper underneath show through), and the color of the soil is an orangeish-brown. Also, there are horizontal lines over the green-striped background. 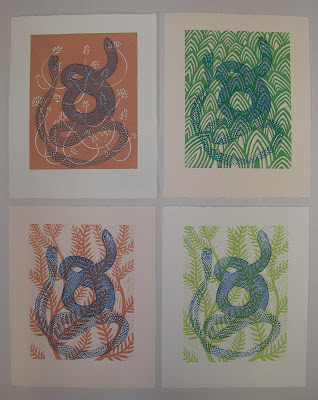 Whenever I print an edition, I proof, or test, my prints by mixing up different colors and printing on different papers. But sometimes I think I like something prematurely. 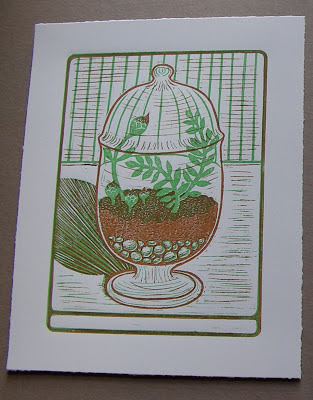 Making a linocut is different than making a painting because I create the image before knowing exactly what color it will be, or before knowing what my imagined color will look like exactly on the paper. 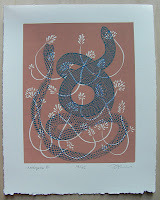 When I experiment in the printing studio, it can sometimes be a shock to see the image in color. It can take awhile to adjust to what I imagined the print would look like. But I choose a final color scheme and then I become so engrossed in the printing process and getting each print to look similar that I don't question the visual choices I've made. Lesson learned: Proof at least one day in advance of editioning, so I can come back to the studio with fresh eyes and be more confident about the choices I've made the day before - or decide I want to change them. 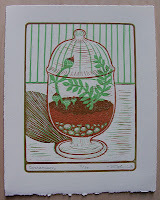 So there you have it, the way one printmaker finds solutions to some of those fun little printmaking challenges. You may decide to do things differently - the way you solve art "problems" is what makes you unique as an artist! 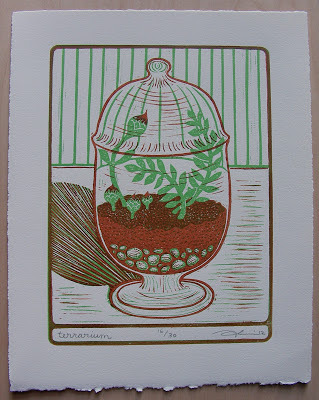 To help kick off the holiday season and my new linocut prints, I am starting early with a SALE in my online shop, Sprout Head! 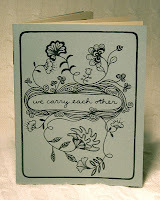 Use Coupon Code HURRAH2012 upon checkout to receive 10% off your entire order! Sale runs from Friday, November 16 - Monday, November 26. 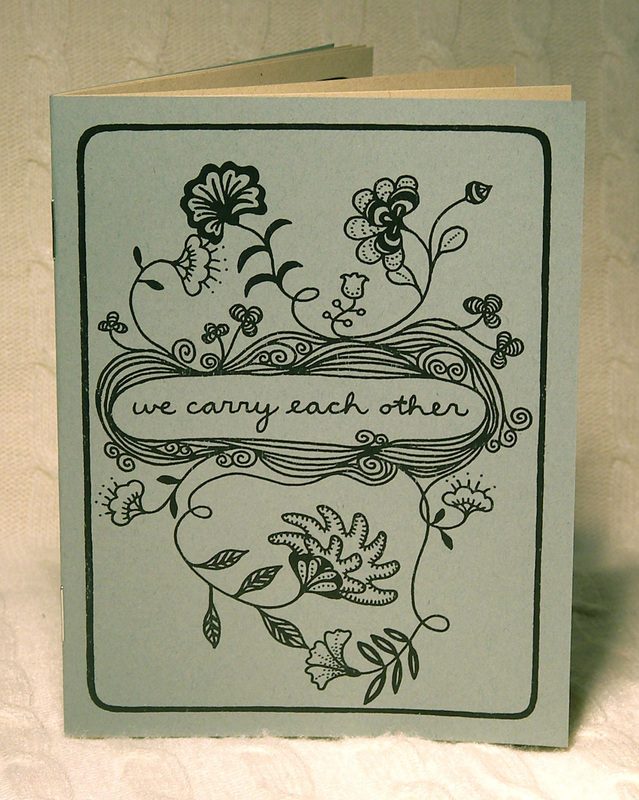 The first 10 orders over $10 (not including shipping) that use coupon code will receive the zine "We Carry Each Other" for free with your purchase! IMPORTANT: You MUST use the coupon code or else you will not receive the discount or bonus zine. Now you can keep up to date on all my course offerings by clicking on the Art Classes tab at the top of my blog! Here is the list of art workshops and classes I'm offering this Winter-Spring 2013 season at The Visual Arts Center of Richmond and the Virginia Museum of Fine Arts Studio School. Click on the name of the workshop to be directed to the course page and/or a link to online registration. You may register for classes online or by phone. For Spring classes, mail-in registration begins Jan 2 and phone-in registration begins Jan 22. Note that Fall students are given the opportunity to register early. Find detailed registration info here. 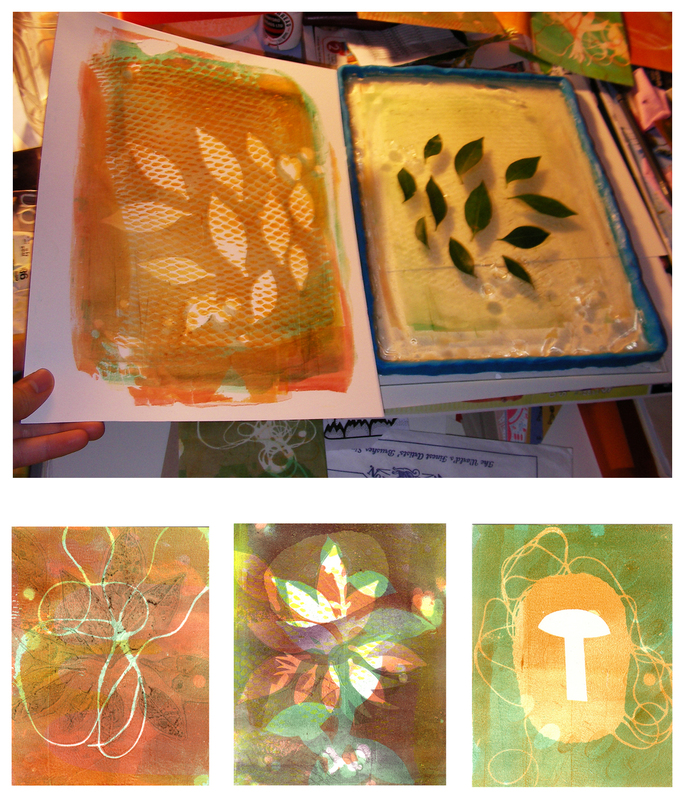 Create one-of-a-kind postcards using gelatin slabs as your printing surface. 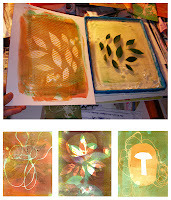 Experiment in a no-mistakes atmosphere, working with hand-cut stencils and found objects such as lace, string, and leaves to create colorful patterns and texture. Then make a simple book structure to store your prints. 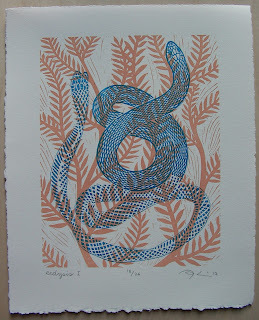 Have fun with this loose, surprising approach to printmaking. All materials will be provided. Discover the fun of printing in color using a spontaneous approach. Carve a few background patterns to print in different colors and combinations, and then print a strong final image on top to bring it all together. 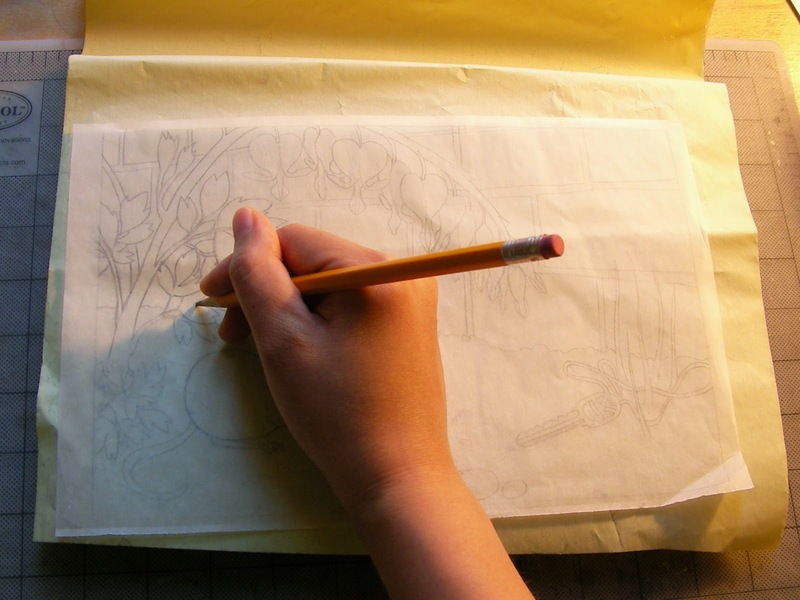 Learn the basics of design, carving, printing, and paper selection. All tools and materials will be provided for the first class, but you may need to bring your own papers for subsequent classes. 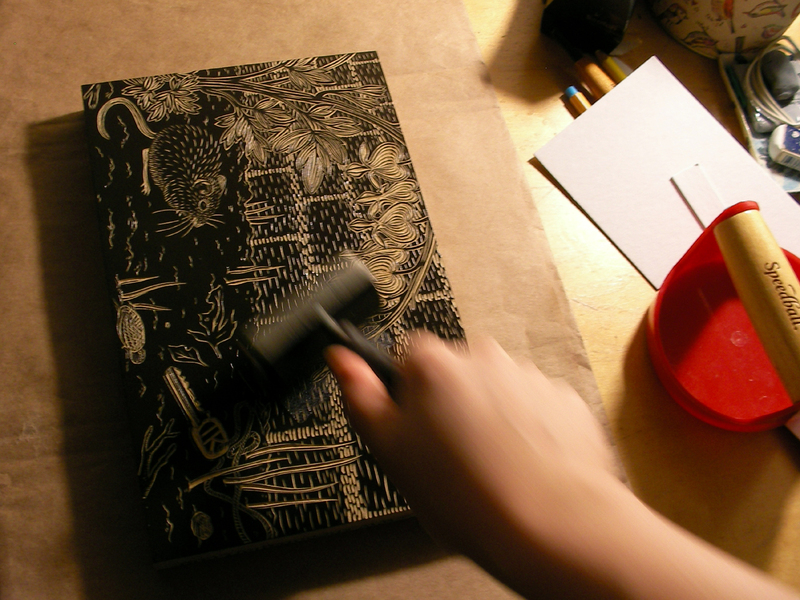 Experiment with printmaking, bookbinding, and the written word in a fun, no-pressure atmosphere. Using dreams as inspiration and with guidance from the instructor, students make monotypes, collages, and found poetry using words cut from old books. This workshop teaches you to create fun and funky jewelry from decorative and recycled papers, such as magazines, newspapers, and wallpaper. Simply cut paper into strips and roll it into beads or experiment with some simple techniques for origami jewelry. Using yarn, thread, beads, and vintage buttons, students assemble their creations into necklaces, earrings, and bracelets. Tools and materials for simple beading provided. If you want to get fancy, bring your own findings, accent beads, and wire. 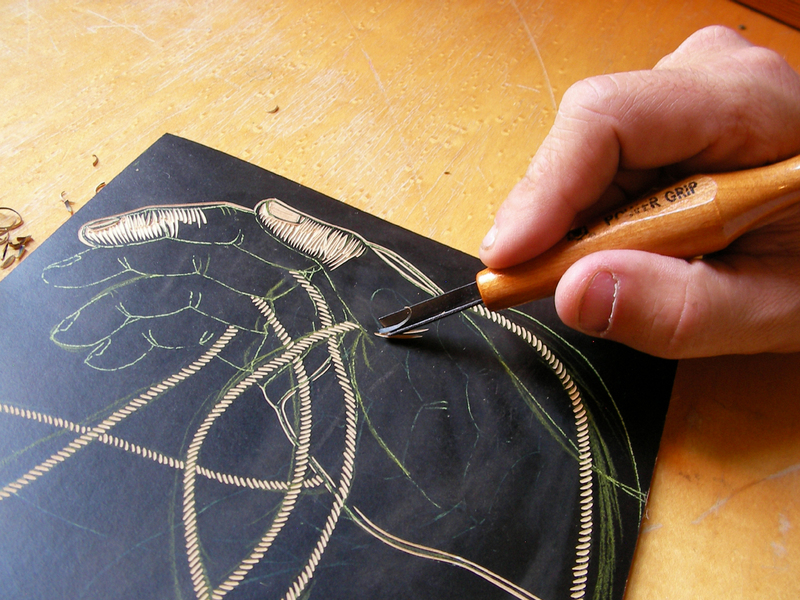 If you have prior experience with printmaking methods produced on the etching press, such as linocut, collagraph and monotype, this is your opportunity to carve out some work time, receive artistic and technical input, and experiment with new ideas. Demonstrations will be provided according to the needs of students. Some materials and tools provided. 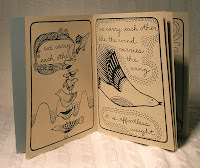 Creativity + everyday materials + photocopier = ZINE! A zine is like a magazine, but its content is only limited by your imagination. 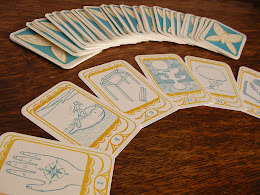 We’ll experiment with several exercises – some silly, some serious – merging art and writing to jog the mind and fill the pages. We’ll discuss how to generate content, design pages, and produce and distribute zines. 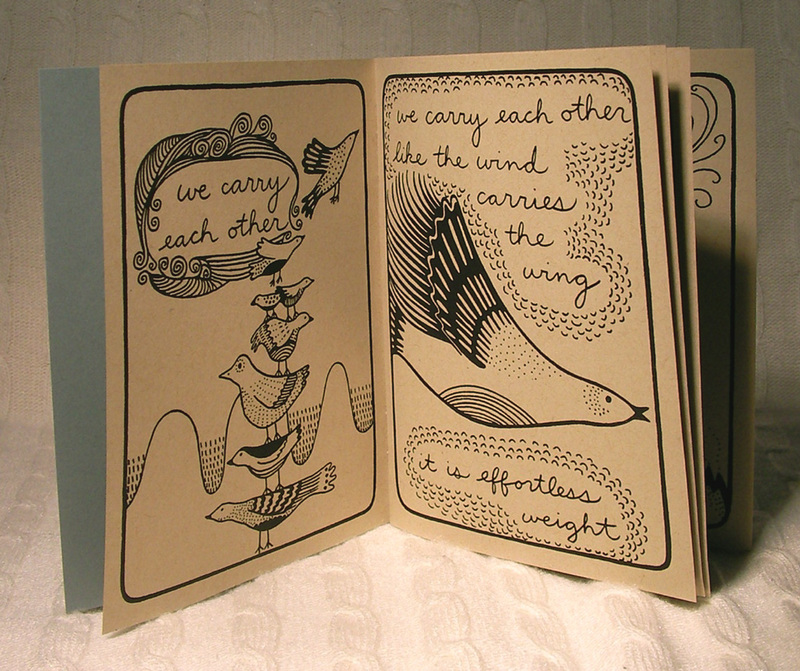 You’ll leave with a copy of a collaborative zine and ideas for starting your next one!